Contact Ardito Law Firm, P.C. Please fill out the form below and a representative from Ardito Law Firm, P.C. will contact you as soon as possible. No fee or obligation unless we get you a recovery. 1. Take pictures, especially for conditions that change quickly. Some examples are defective walkways or roadways and the scene of an auto accident. 2. Save text messages that are relevant to your case. If you delete them, you may not be able to get them back until after a court case is filed. This is because many cell phone providers require a subpoena before they will give you a copy. In cases where the text is an important part of your law suit, having your messages available before the case starts can be necessary in order to evaluate your claim. 3. DO NOT send defective products back to the manufacturer! Many times the manufacturer will ask you to return a defective product to the company so they can review the claim. However, if they refuse to pay a fair settlement, it is unlikely that they will return the item to you. Even if it is returned, it will probably not be in the same condition and lose much or all of its value as evidence. 4. DO NOT repair or remove damaged parts from your car before the insurance companies can inspect it. 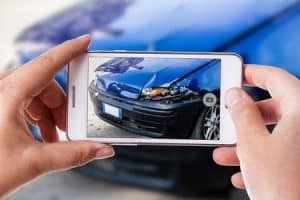 If they do not get a chance to inspect the original damage to the vehicle, your claim may be denied. Also, the damage to the vehicle can provide valuable information about how the accident occurred. 5. Finally, DO NOT give statements over the phone to any insurance company, including your own. Call us right away to assist you with this. Remember that many deadlines are imposed by law, so call as soon as you can do it safely and after you have received medical attention. Stay tuned for part 2 of Evidence For Everyone next week. As always, help is a phone call away.